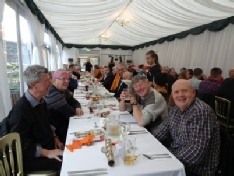 Social and entertainments secretary Roy Eagles runs the Xmas lunch party which has gone from strength to strength since he took over. Starting with the City Bar before its refurbishment we have now moved to the BlueBrick (TableTable) restaurant off Sun Hill where Roy again welcomed star guests as friends. Menu 2014 Price £20 per head; please pay when booking.